Excess sugar in your daily diet can cause serious health issues. 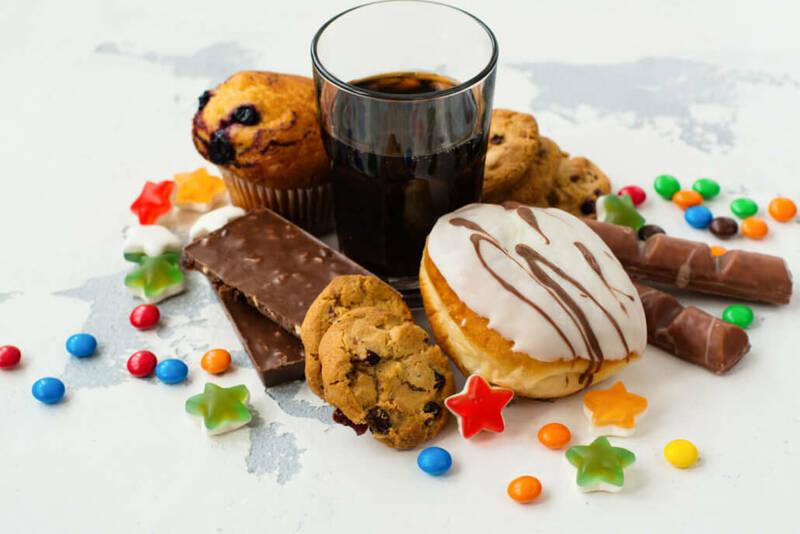 While natural sugars are necessary to provide energy to cells throughout your body, too much processed sugar can increase your risk of serious health problems that include diabetes, obesity and heart disease. Too much sucrose can even increase the visible signs of aging to make you look older than your years. Here are some facts you should know about how excess intake of sugars can impact your state of health. How Does Sugar Affect Your Health? Consuming too much sucrose can have a number of serious health effects. According to a 15-year study conducted by Harvard researchers and published in the Journal of the American Medical Association in 2014, people who got between 17 and 21 percent of their calories from sucrose were 38 percent more likely to die of cardiovascular disease compared with those who obtained only 8 percent of their calories from sucrose and other sugars. • Sucrose is classified as a disaccharide that consists of one molecule of glucose and one of fructose. It is generally extracted from cane or beets and processed to ensure a bright white color. • Fructose is classified as a monosaccharide and is found in high concentrations in corn, cane and beets. High-fructose corn syrup is commonly used to sweeten soft drinks, cereals and many other foods and beverages. Glucose is not usually added to foods. Instead, it is produced when your body breaks down simple and complex carbohydrates and is used to provide energy to cells and physical processes. • Pancreas: One of the most obvious ways in which excess intake of sugars can affect your internal organs is in the development of Type 2 diabetes, which is the result of the failure of the pancreas to produce sufficient insulin. Processed sugars are often implicated directly in the development of diabetes and indirectly because of their role in promoting obesity. This can have a significant and serious effect on the ability of the pancreas to process sugars and to regulate insulin levels, which can eventually lead to shutdown of the pancreas and dependence on insulin injections for patients who do not control their blood-sugar levels. • Liver: Your liver is responsible for filtering out toxins and processing nutrients. Too much fructose or glucose can overload this system, making it more difficult for your liver to perform its role. Sugars may be converted to fat within the liver, which can sometimes result in fatty liver disease that can threaten the function of this vital organ. • Kidneys: Consuming too many sugars can also tax the blood-filtering capabilities of the kidneys, reducing their effectiveness and allowing toxins to build up and collect in various areas of the body. This can lead to increased fat and weight gain while diminishing the ability of the immune system to protect against infections and viruses in the outside environment. • Heart: Ingesting too much sucrose and fructose can result in high cholesterol, which can lead to cardiovascular problems including heart disease and high blood pressure. Reducing your intake of sugars can often reduce the risk of these issues and improve your overall state of cardiovascular health. Sugars can have serious effects on the health and physical condition of individuals in otherwise good health. For those with thyroid issues and other physical problems, however, the negative effects can be far worse. Avoiding excess sugars is essential to ensure the best possible health for those with thyroid imbalances. This can reduce inflammation and other factors that could cause complications for individuals with thyroid problems or other hormonal issues. Because sugars can reduce the efficiency of your entire metabolic system, they can also lead to significant weight gain in some individuals. Too much sucrose or high-fructose corn syrup has been demonstrated to increase the risk of obesity in both children and adults, which can increase the risk of cardiovascular issues, high blood pressure and diabetes. Reducing the number of sweets and deriving energy from complex carbohydrates like those found in vegetables and whole grains can have a significant positive effect on health and can reduce the likelihood of obesity among people of all ages and activity levels. • Sugars bond with proteins inside your bloodstream in a process known as glycation. This can produce toxins and can reduce the function of elastin and collagen, two protein compounds that are responsible for maintaining the youthful appearance of your skin. • Glucose is produced when your body breaks down sugars. This substance provides energy for cells. Excessive glucose levels, however, can result in diabetes and a reduction in the effectiveness of human growth hormone, which is necessary for cell regeneration and can help prevent the formation of wrinkles by ensuring healthier skin. • Reducing your intake of sugars can also limit your risk of obesity, which can help you look younger and healthier. Adjusting your diet to reduce the amount of sucrose, fructose and other sugars can help you to stay healthier and to look younger. The right dietary changes can make a big difference in your daily life. Taking steps to cut out processed sugars and excess fat as much as possible can help you to live a longer and healthier life. These lifestyle changes can also allow you to look younger and to continue your journey in the happiest and most health-conscious way possible now and into the future.